Grades: K-1 8:20 a.m. - 1:50 p.m.
Grades:2-8 8:35 a.m. - 3:05 p.m.
Grades:2-8 Wed. 8:35 a.m. - 1:50 p.m.
Bienvenido a Mandarin Lakes K-8 Academy, an outstanding bilingual international school organization (BISO). 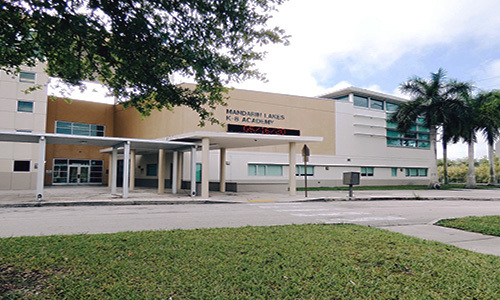 At Mandarin Lakes K-8 Academy, all students are afforded the opportunity to learn in a safe, nurturing and academically enriched school where they are treated as our own. All students receive instructions in core subject areas with the opportunity to acquire a second and or third language, namely Spanish and or Mandarin Chinese. Through our rigorous academic offerings, all students experience inquiry and discovery-based learning, requiring them to become critical thinkers and problem solvers. As we enthusiastically enter the 2018-2019 school year, we will embrace and consistently demonstrate our theme “One School Going Above and Beyond for All Students!” We the staff of Mandarin Lakes K-8 Academy is of the belief that greatness lies in every child and accept that it is our duty to inspire greatness daily by going above and beyond. This belief is the driving force behind the daily actions we take to affect positive change and bring out greatness in all our students. If you are new to the area or considering a change in your child’s current educational setting, please contact our school at 305-257-0377 to schedule a personal tour of our campus.